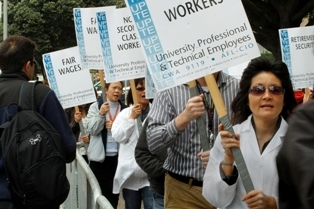 “Historic” – that’s the word UPTE members are using to describe a tentative agreement reached Friday between the union and UC after three years of negotiations, which is being covered widely in the media, including the Los Angeles Times, San Francisco Chronicle and KTVU in Oakland. Nearly 15,000 UC researchers and techs (the RX/TX unit) and health care professionals (the HX unit) will have the opportunity to vote on the agreement this week, which includes pay increases of 11.5% to 13% over four years. The HX unit would also receive step increases. Perhaps most importantly, the agreement preserves the single-tier UC pension system for both current and future UC employees, in exchange for employees paying an extra 1% into the system. It also does away with UC’s “Rule of 50,” which would have subjected half of current employees to lessor pension benefits (see an overview here). Three years ago, UC executives launched a full-court press to force unions to accede to their new two-tier pension plan, complete with inferior benefits and higher costs. UPTE members up and down the state demonstrated, signed petitions and letters, and voted overwhelmingly to strike. Hundreds also took the issue directly to incoming UC president Janet Napolitano, as reported in the latest UPTE Update, who reversed the anti-union course of her predecessor, Mark Yudof, and reopened talks with the union. UPTE fought the battle in coalition with the California Nurses Association, which settled their contract for UC’s 12,000 nurses last month along similar terms. AFSCME, representing service and health care workers, is still working for a contract that preserves a one-tier system. Other unions at UC previously agreed to the two-tier plan, but will have the chance in future negotiations to re-negotiate. UPTE-eligibleadministrative professionals, who are still formally unrepresented, will also have a chance to reverse the inferior two-tier pension system if they vote for union representation. UC lecturers represented by the American Federation of Teachers (AFT) have ratified a new two-year contract with UC. Among the terms in the contract was the two-tier pension system that UC sought, which raised retirement ages, reduced retirement benefits, and increased employee contributions. The contract includes a 3.5% wage increase and funding for professional development. Faculty at the University of Illinois, Chicago, have voted by 95% to authorize a strike if current negotiations remain at an impasse. They voted for unionization in 2011, in a combined union drive between the American Association of University Professors (AAUP) and the AFT. U of I management has been fighting them in court and dragging its feet in bargaining, and after 15 months of negotiations, anger has come to a head. The Campaign for College Opportunity has released a report, The State of Blacks in Higher Education, showing alarming declines in application rates of African Americans to UC since Californians voted to end affirmative action programs in 1996. Between 1994 and 2010, acceptance rates of African American students fell from 51 percent to 15 percent at UC Berkeley, and 58 percent to 14 percent at UCLA.